Alissa Quart is the executive editor of the journalism non-profit Economic Hardship Reporting Project. She co-founded its current incarnation with Barbara Ehrenreich. She is also the author of four previous acclaimed books, Branded, Republic of Outsiders, Hothouse Kids, and the poetry book Monetized. Her most recent book is Squeezed. 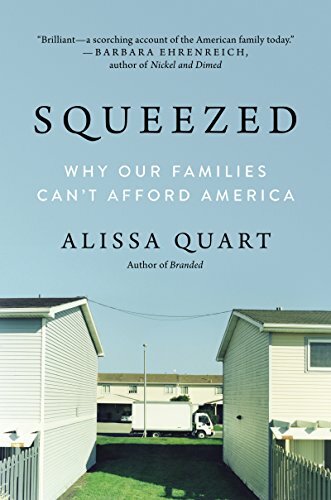 ALISSA QUART: So, for some of the people I interviewed in 'Squeezed', when they were going through economic hardship they'd get sick physically, they would be psychologically troubled, they'd have to go on anti-anxiety medications—sometimes they wouldn't even have healthcare so that would be an added expense, and some of the subjects might experience something called 'decision fatigue' where they'd be unable to make decisions or choices in their lives—basic choices—because they've been so overwhelmed by the feeling of economic uncertainty. They were thinking constantly "How do I survive?" rather than "How do I lead a better life?" or "How do I get my kid on the best course?" And so that's commonplace, just that overwhelmed aspect when you don't have resources. That's all you're thinking about. One of the challenges for people seeking employment in a gig economy is that they're disposable; they can always be replaced by somebody else, they may not have relationships with another human being at Uber or at Lyft, whatever. Supposedly it's this idea of independence, but it's often in fact this kind of free-floating quality where they're not clearly connected to a boss or colleagues. And I think that can be really dangerous, because then these peoples' experiences are not humanized to the people who are hiring them, they're just cogs in wheels, and we should really start thinking about that because I think it can be really debilitating. I talk about teachers who drive Uber in a chapter, and I think for many of them they were recruited by the company. They had a motto four or five years ago: "Uber—teachers driving our future." So teachers and nurses were attractive to Uber simply as middle class icons, but they weren't attractive enough to the people in their community who they were teaching or the politicians in their community to give them a wage so they wouldn't have to drive Uber on the side. So to me that's one of the dangers of the gig economy too, that the formally middle class can be used just as a symbol and a kind of respectability that they can be offering these companies while they're kind of riffling through these once-stable professions for solid people that they can exploit. Many of the people I wrote about are not in organizations or even in corporations or contingent, which means that they work part time, on contracts, they work gigs, which is now a huge amount of the population, or they work too-few hours to be counted as employees. So I'm not sure it becomes an organizational thing most of the time, but in terms of what we're doing at Economic Hardship Reporting Project we're trying to pay journalists who have fallen on hard times a dollar a word plus expenses. And that's just like one small way to keep them afloat. We have people writing for us who were living without heat, on food stamps, on government medical care, they were really struggling, and this is one thing that I've noticed has been interesting lately—I call them sort of white collar alt-labor, this is like white collar unions, almost, for journalists, for other employees in the past who're not necessarily unionized freelance journalists. And what we're doing is part of that, but there's all sorts of other things cropping up. There are collectives for caregivers that I've written about, so they're sort of working together, they're owning the apps where they rent out—where they try to get customers for housecleaning or nannying. And so I think, what can organizations do? Organizations can try to empower their poor workers by giving them resources, both economic and from the companies themselves—for instance, like an app that they themselves would own a part of rather than just simply the company owning the app and the worker just this teeny piece of teeny "task rabbit", they would instead be a part of the app. Cooperatives is another way I think that we can start to think about that, especially web-based cooperatives. That's becoming really important given the concentration of wealth where we have a teeny number of people owning these companies and just hundreds of thousands of people working for them driving Uber, cleaning houses, et cetera. We can start talking about people owning a share of the digital economy and the gig work that they're doing.